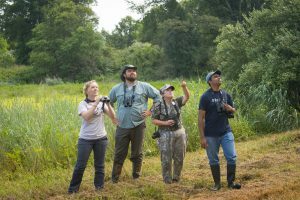 Anyone who observes birds, even just those in your yard, can report data on breeding bird observations in Virginia. We encourage experienced birders to sign up as the principal atlaser (or volunteer surveyor) for one or more atlas blocks. Newer birders may consider teaming up with one or two more experienced birding friends to cover an atlas block together. Now! This breeding season (2019) marks our fourth of five field seasons. The cold rainy winter months are a great time to begin exploring our project. Check out our current data coverage maps to learn what areas of Virginia are still in need of data. Our volunteers have collected many great breeding observations, but there are still many gaps to fill in the final two years of the project. First, check out the Atlas Effort maps on our project eBird portal (ebird.org/atlasva/effortmap). These maps give you an idea of how much information has been logged in any given Atlas block in the state. – Zoom in and out of atlas regions to search for preferred atlas block. Next, review all the key materials, including the Handbook and Data Forms. – Be sure that you are not only familiar, but comfortable with the survey protocols and use of the data forms prior to beginning atlas activities in the field. Familiarize yourself with the VABBA2 eBird portal. – If you are new to eBird, check out some of the how-to tutorials on our eBird page. These will help you get acquainted with the eBird system of data entry. – For experienced eBirders, note that you must use the custom VABBA2 eBird portal (ebird.org/atlasva) to report your breeding bird data. If you do not, the project will not receive your data. Get out in the field! – Once you’ve signed up, get to know your atlas block. – Learn the block boundaries, roads, trails, land access, etc. – Consider whether you will need to request permission to access areas within your block (See Land Access protocols in the Atlas handbook). This should be done prior to the day you will first attempt to survey.